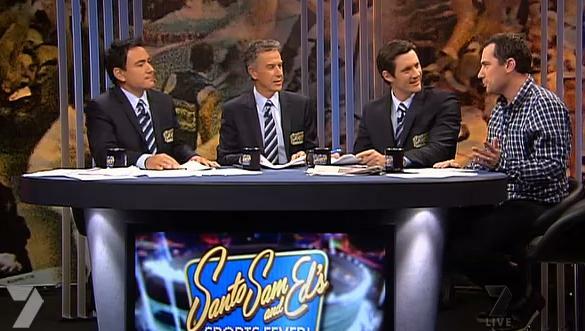 Sancho, Stan and Ted graced an average 182,000 television screens last night at around 10:37pm (probably an extra 1 million viewers on a two minute Optus time delay are missing somewhere). A wonderful show that if you don’t follow any type of sport, Sports Fever! makes it extremely entertaining. * We Watched It So You Didn’t Have To – crazy and boring sporting events that the guys watched and try to find the best parts. The Tour of Qatar had Sam Pang sitting on the edge of his seat with anxiety, while Santo Cilauro was puzzled to see how many sponsors could fit on a sports gun for the Bi-athon World Cup in Oslo. Missed it? Check program guides for repeats on 7Mate, hit up Sports Fever! Facebook page or watch online for the next seven days on Plus7. I’m off to chase down Mr Snuggles. channel 7 thankyou for putting this program on. however, WTF is it doing on at 1045pm? please understand the people who watch Sports Fever arent the least bit interested in the lead in program, we just keep switching til it comes on. PUT SPORTS FEVER ON AT 9F***NG30PM!!! !